I'm so happy that it's finally spring and the weather is getting nicer. I recently did a Winter Favourites post so I don't have a lot of new favourites for this month, but I do have a few. This is such a good leave in conditioner. It makes my hair so soft and shiny. I am not a big fan of the spray because it doesn't come out in a fine mist due to it's thick consistency so I like to spray some into my hand and use my fingers to run it through my hair. I've been using this before bed this past month and I think my skin has been looking really good lately. It is an oil but it sinks in really fast. When I wake up my skin looks rejuvenated and feels so soft however I'll need to use it longer to see the long term effects. I like wearing a lighter foundation in the warmer months and this BB cream is perfect. It's really dewy and moisturizing. It hides imperfections and makes my skin look more even, but still really natural. I've been obsessed with this lilac nail polish this month. It's really opaque, fast drying and the applicator is big which means you can paint your nails really fast. Plus it lasts about a week on me (with a top coat) without chipping. If you want to see my Nail Polish of the Day (among other things) follow me over on Instagram @Makeupbymeggy. Once the weather gets warmer I replace my warmer scented body lotions with something a little fresher. 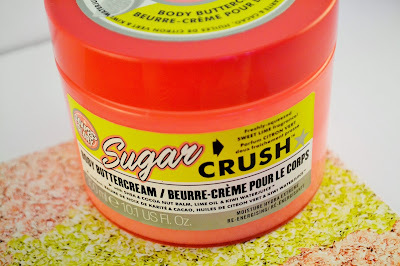 I really love the lime scent of this body butter plus it's really moisturizing. What have your favourites been during the month of April?